This sample 11 day (10 nights) itinerary covers Palermo, Agrigento, Ragusa, Siracusa, Etna & Catania. The services we provide as part of our comprehensive packages include accommodations, bus & ferry tickets, transfers (airport, port & bus station) and city tours. In addition to the tours included we can arrange a number of excursions based on your own interests. There is also an option to travel between cities by private car or van transfers at an extra cost. Our Destination Manager in the region provides assistance before and during your travels. They will be available to you leading up to the trip to answer any questions and arrange local services. You will be provided with information on the best these destinations have to offer including things to see and do, restaurants, entertainment and other insider tips. Upon arrival we will provide you with a local cell phone that you can use to contact our Destination Manager throughout your trip. In all of our destinations we offer a variety of accommodation options including boutique style hotels, charming B&Bs and spacious apartments ranging from a three to five star level. From our first hand experience we can ensure they are all clean, comfortable and centrally located. We generally discourage chain hotels but provide accommodations with unique features or an authentic feel. Upon arrival at Palermo airport, our driver will be waiting for you at the arrivals and will take you to the hotel in Palermo. Take a leisurely stroll through the main squares, markets and monuments of the city center to taste the best palermitan street food. A well balanced combination of food, art, history and culture. You'll join a like-minded group of travelers, meeting up in one of the city's most beautiful squares. As you stroll through the city's most famous markets your guide will tell you about the history of Palermo itself as well as the various food and drink you'll be sampling along the way. A light breakfast is advised! 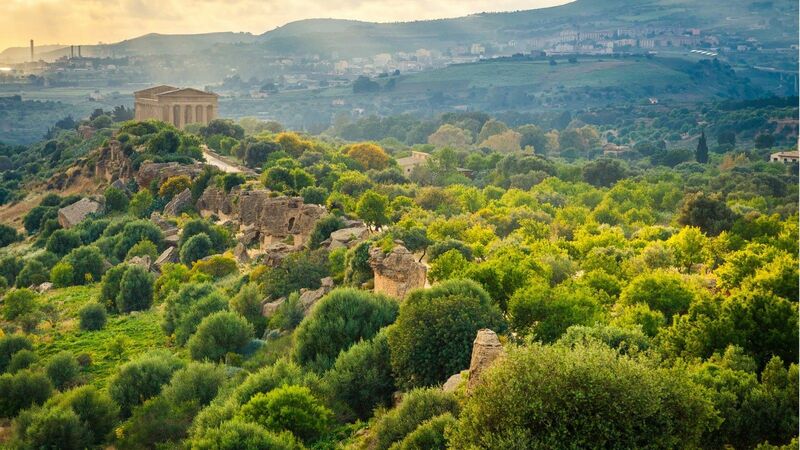 After breakfast, your driver will meet you at your hotel and transfer you to the accommodation in Agrigento. Along the way, you will have the chance to visit a splendid winery on scenic hills and try the local production. We recommend to contact us in due advance to book the visit. In some wineries, it is possible to have a light tasting meal, to be booked together with the visit. You will pay the visit and meal (if any) at the winery directly, upon consumption. The journey will take approx. 2 and a half to 3 hours plus the time you spend at the winery. Palermo doesn’t care if you like it. It’s the capital city of Sicily, and its biggest. Reminiscent in parts of Naples. It's not a place you'll find thronged with tourists, but the locals sure like to be outside. A hub of activity and a gridlock in rush hour and at weekends. Despite the order of the main avenues, the twisting lanes of the Centro Storico provide plenty of opportunities to get lost. Cheek by jowl here you will find grand palazzos (much of European royalty had their vacation palaces in Palermo) and scruffy tenements. Turn a corner in a grungy alley and you’re faced with an ornate fountain or pomp and circumstance statue. All of this provides a rich backdrop to your time in Palermo. Many have come before. The city was founded nearly 3,000 years ago and Palermo has truly been a crossroads of the great civilizations. Phoenicians, Greeks, Romans, Arabs, Normans, Germans, Spanish, Bourbon, and finally Italian rulers have held dominion over the city and left their mark. Its international airport and busy seaport make it a great starting or finishing point for an exploration of Sicily. Your driver will bring you directly to your hotel, located in the area of the Valley of the Temples archeological park. You might have time enough to enjoy the visit in the afternoon, for which we recommended a private guide to be booked in advance. Don't miss seeing what the ancient Greeks left behind in Southern Italy. There are several ancient temples worth exploring and it's interesting to learn about the fascinating history of the area. It's definitely worth taking the tour with the guide as you'll come to a better understanding and appreciation of the unique and interesting history of this region. After breakfast, your driver will meet you at your hotel and transfer you to the accommodation in Ragusa. The journey will take approx. 3 hours. Your driver will bring you as close as possible to your accommodation located in the historic center of Ragusa Ibla. Ragusa Ibla is a splendid example of ancient, although vibrant and lovely community. Perched atop a scenic cliff facing (relatively) modern Ragusa, Ibla became popular among Italian and international readers as the main location of the adventures of the popular fictional detective "Commissario Montalbano". For art and history lovers, a plethora of UNESCO-heritage buildings are easily accessible, as well as spectacular hikes on the hills nearby. With an excellent selection of restaurants, from cosy family-style taverna to Michelin-starred, you have plenty of opportunities to taste the best examples of the rich local culinary excellence. This full-day tour gives you the chance to explore some UNESCO-listed Baroque architecture with an expert local guide. 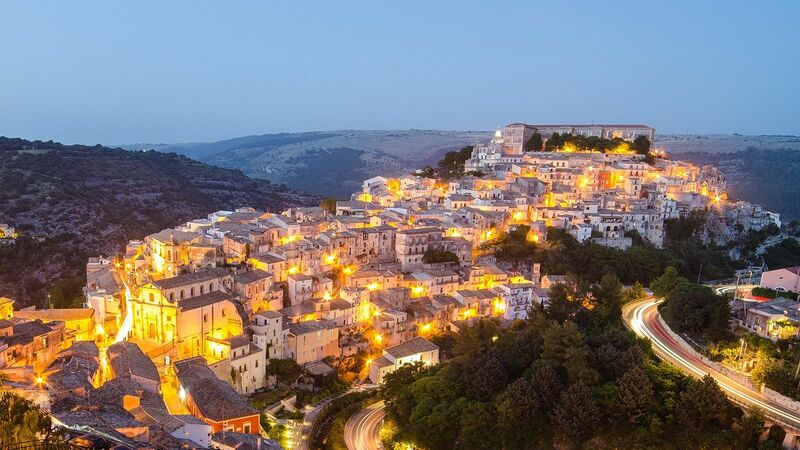 You'll set off from your accommodation and drive to your destinations: Ragusa Ibla, Modica, and Noto. Each is impressive in its own right, and as a whole they represent some of the world's finest Baroque architecture. Your guide will tell you all about them, and you'll also have the chance to stop for a delicious local lunch. At the end of the day you'll be driven back to your accommodation. 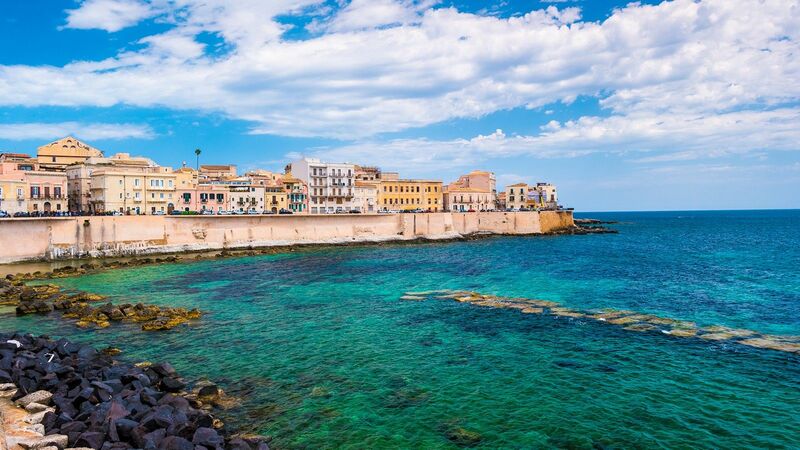 After breakfast, you driver will meet you at your hotel in Ragusa Ibla and transfer you to the hotel in the center of Ortigia, the splendid island of SIracusa. Your driver will bring you to your accommodation located in the historic center of Siracusa, on the splendid island of Ortigia. The tour start with the visit to the fish market where we spend one hour approximatly. They will show you some typical vegetables in season, the Mediterranean fish, tasting some sicilian cheese and olive oil. Then we go back home, and they will be friendly helpful to explain you with love and passion how to cook two three dishes of our region and you can cook with me surrounded by an informal setting based on an atmossphere and typically Sicilian hospitality. At the end will be the aperitif and lunch. Discover the tasty traditional Sicilian recipes with an expert cook, starting from the exploration of the lively and colourful food market and finishing with a social meal with the goodies you prepared. A charming tour to explore 2 tiny villages in the mountains close to Taormina chosen in the 70’s by da F.F. Coppola for some episodes of the Godfather saga: Savoca and Forza d’Agrò. The visit of these settlements, almost frozen in time, is intense and emotional. Optional visit to the Museum of Chocolate of Forza d’Agrò, (not included, 5 €). Bring an appetite on this tour because you'll be eating your way through the streets and squares of Catania. With an expert local guide you'll sample some of the most delicious street food in the city, all while taking in the beautiful monuments and architecture. You'll get a local's point of view on where to eat, what to buy, and what to try. It's a very tasty tour. After breakfast it is time to leave Siracusa but plenty more adventures wait for you: your destination is the unmistakable shape of the mighty Etna volcano. You can drive directly to the countryside accommodation "agriturismo" of your choice for a relaxing afternoon, or decide to visit Catania, ideally with an entertaining and above all very tasty street food tour with our expert local guide. In this proposal, we include a 4-hour stop in Catania. Your driver will bring you to your accommodation in the scenic country side on the slopes of Etna volcano. Dinner will be served at the agriturismo, which is our recommended suggestion for your relax and enjoyment. If you wish to dine at the accommodation, please let us know in advance so we make sure to book a table for you. Otherwise the owner will suggest the best restaurants nearby. 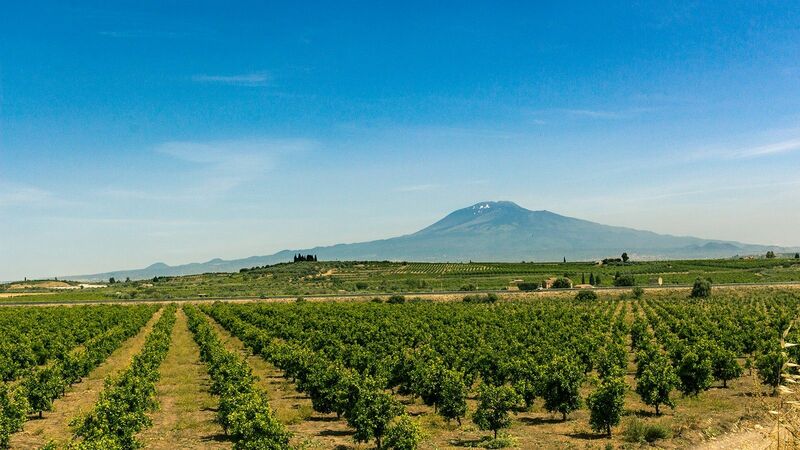 After a short ride you can explore Sicily's iconic symbols: the mighty Etna volcano, the highest volcano in Europe and one of the largest and most active in the world. This UNESCO World Heritage Site is also a park hosting unique flora and fauna, villages and farms, and traditional methods of forestry, bee-keeping, wineries, stonework and carpentry. You'll want to see the “Crateri Silvestri,” which are small inactive volcanic cones that are surrounded by ancient lava flows. The view beyond the mountain’s hundreds of subsidiary cones and craters extends across the whole of Sicily, the Aeolian islands and Calabria. We recommend that you join a tour with an expert local guide and that you do not venture outside of clearly marked paths. Always make sure to ask the hotel and locals in case there are any hazards due to possible volcanic activity in the area. Taormina is the most famous destination in Sicily, hosting actors and actresses in an atmosphere of glamor, luxury and seaside relaxation. We recommend visiting the fascinating Greek theater, nestled in a splendid location with spectacular views over the scenic beaches and the snow-capped Etna volcano. Then take some time for a nice walk among the picturesque medieval streets and go shopping for local handicrafts, which include coral jewels, precious laces, ceramics, sweets and much more. 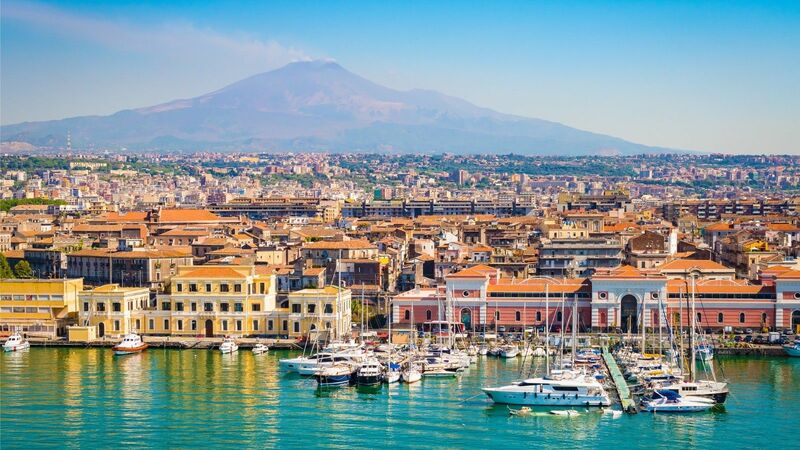 After breakfast, your driver will transfer you to Catania airport in due time for your departing flight. Your driver will bring you to Catania airport in due time for your flight. In case of international flights, we recommend to be at the airport around 2 hours in advance, and in any case according to your airline's instructions. Catania is characterised by an original Baroque style and unique streets built with black lava stone, creating an elegant effect. This was the capital of the Kingdom of Sicily under the Aragonese dynasty and is notable for the “pescheria," the ancient fish market. There's also a scenic cathedral and the splendid baroque Via dei Crociferi, with the famous St. Benedict Monastery.